Depository Investment Group - низкодоходный хайп партизан. Платит. 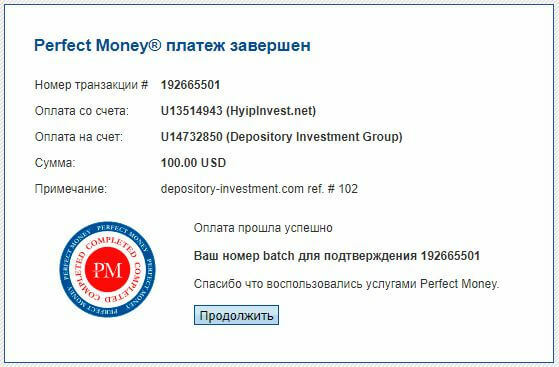 Проект «Depositоry Investment Group» добавлен на мониторинг в раздел «Тестируемые». Рефбек 100% (10% от Вашего вклада). Поскольку это первый проект под страховкой на блоге, позже будет инструкция к страховке. Проект партизан на самописном движке. Кошельки верифицированы и небыли ранее замечены в использовании. Проекта пока нигде нет. Если заходить, то тестовыми суммами, тем более есть небольшая страховка. Первый депозит успешно завершен. 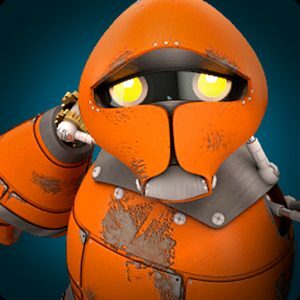 Получено 50% чистой прибыли. Пошли на реинвест. Сделала вклад но не могу заказать рефбек, пишет Ошибка добавления заявки на рефбек. А ввожу все правильно. Рефбек выплачен. Прошу прощения за неудобства. 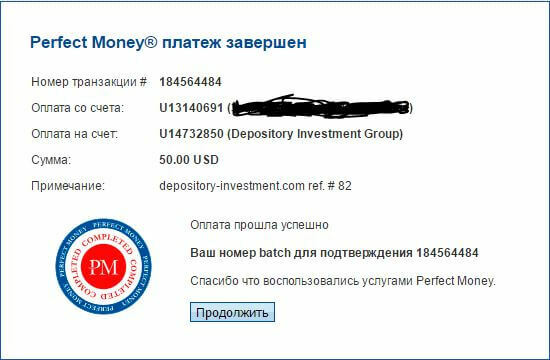 Received Payment 3.1 USD from account U14732850 to account U13514943. Batch: 182987421. Memo: API Payment. depository-investment.com. Приветствую всех. Любые вопросы задавайте в комментариях, по возможности отвечу. Профита всем! Received Payment 1.5 USD from account U14732850 to account U13514943. Batch: 183240515. Memo: API Payment. depository-investment.com. Received Payment 1.5 USD from account U14732850 to account U13514943. Batch: 183305321. Memo: API Payment. depository-investment.com. 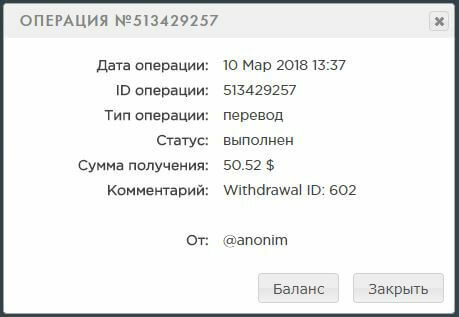 Зашёл на 50$, заказал рефбек! Received Payment 9.00 USD from account U14732850 to account U13514943. Batch: 184566548. Memo: API Payment. depository-investment.com. Received Payment 0.75 USD from account U14732850 to account U1314****. Batch: 184701758. Memo: API Payment. depository-investment.com. Received Payment 1.5 USD from account U14732850 to account U1314****. Batch: 184876093. Memo: API Payment. depository-investment.com. Received Payment 1.5 USD from account U14732850 to account U13514943. 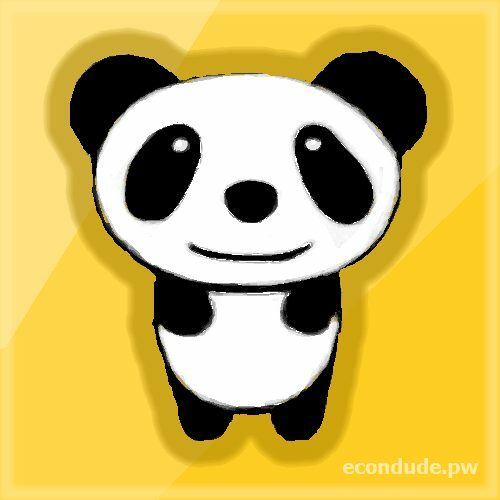 Batch: 185116506. Memo: API Payment. depository-investment.com. Received Payment 2.25 USD from account U14732850 to account U1314****. Batch: 185145123. Memo: API Payment. depository-investment.com. Received Payment 1.5 USD from account U14732850 to account U13514943. Batch: 185257109. Memo: API Payment. depository-investment.com. Received Payment 1.5 USD from account U14732850 to account U1314****. Batch: 185383380. Memo: API Payment. depository-investment.com. Received Payment 1.5 USD from account U14732850 to account U1314****. Batch: 185517882. Memo: API Payment. depository-investment.com. Received Payment 2.25 USD from account U14732850 to account U1314****. Batch: 185848034. Memo: API Payment. depository-investment.com. Received Payment 1.5 USD from account U14732850 to account U13514943. Batch: 185929554. Memo: API Payment. depository-investment.com. Сделал вклад 100$, рефбек получил, СПАСИБО! Received Payment 15.00 USD from account U14732850 to account U13514943. Batch: 185997846. Memo: API Payment. depository-investment.com. Received Payment 3.00 USD from account U14732850 to account U13514943. Batch: 186115888. Memo: API Payment. depository-investment.com. Received Payment 3.00 USD from account U14732850 to account U1387****. Batch: 186174209. Memo: API Payment. depository-investment.com. Received Payment 3.00 USD from account U14732850 to account U1314****. Batch: 186190064. Memo: API Payment. depository-investment.com. Received Payment 1.50 USD from account U14732850 to account U1387****. Batch: 186174209. Memo: API Payment. depository-investment.com. Received Payment 1.5 USD from account U14732850 to account U1387****. Batch: 186355071. Memo: API Payment. depository-investment.com. Received Payment 1.5 USD from account U14732850 to account U1314****. Batch: 186359237. Memo: API Payment. depository-investment.com. Received Payment 4.5 USD from account U14732850 to account U13514943. Batch: 186407944. Memo: API Payment. depository-investment.com. Received Payment 1.5 USD from account U14732850 to account U13514943. Batch: 186495724. Memo: API Payment. depository-investment.com. Received Payment 1.5 USD from account U14732850 to account U1314****. Batch: 186572170. Memo: API Payment. depository-investment.com. Received Payment 1.5 USD from account U14732850 to account U13514943. Batch: 186609944. Memo: API Payment. depository-investment.com. Received Payment 1.5 USD from account U14732850 to account U1387****. Batch: 186694323. Memo: API Payment. depository-investment.com. Received Payment 1.5 USD from account U14732850 to account U13514943. Batch: 186998185. Memo: API Payment. depository-investment.com. Received Payment 1.5 USD from account U14732850 to account U1314****. Batch: 187032039. Memo: API Payment. depository-investment.com. Received Payment 1.5 USD from account U14732850 to account U13514943. Batch: 187074957. Memo: API Payment. depository-investment.com. Received Payment 1.5 USD from account U14732850 to account U1387****. Batch: 186694323. Memo: API Payment. 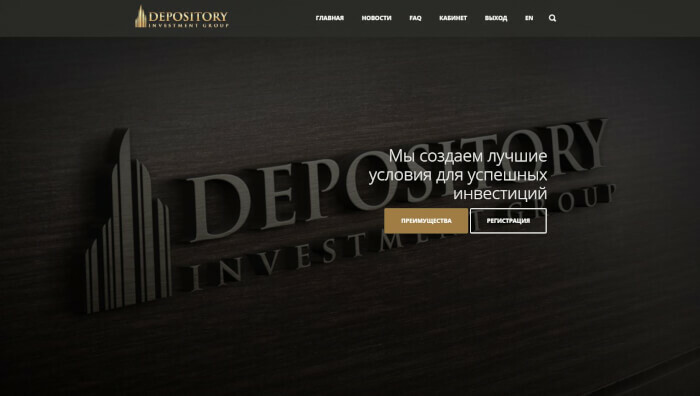 depository-investment.com.. Received Payment 3.00 USD from account U14732850 to account U13514943. Batch: 187246450. Memo: API Payment. depository-investment.com. Received Payment 2.25 USD from account U14732850 to account U1314****. Batch: 187248160. Memo: API Payment. depository-investment.com. Received Payment 7.5 USD from account U14732850 to account U13514943. Batch: 187348219. Memo: API Payment. depository-investment.com. Received Payment 0.75 USD from account U14732850 to account U1314****. Batch: 187386563. Memo: API Payment. depository-investment.com. Received Payment 1.5 USD from account U14732850 to account U13514943. Batch: 187443030. Memo: API Payment. depository-investment.com. Received Payment 1.5 USD from account U14732850 to account U1314****. Batch: 187616022. Memo: API Payment. depository-investment.com. Received Payment 14.25 USD from account U14732850 to account U13514943. Batch: 187700310. Memo: API Payment. depository-investment.com. Received Payment 1.5 USD from account U14732850 to account U13514943. Batch: 187742940. Memo: API Payment. depository-investment.com. Received Payment 1.5 USD from account U14732850 to account U1314****. Batch: 187779946. Memo: API Payment. depository-investment.com. Received Payment 3.00 USD from account U14732850 to account U13514943. Batch: 187928742. Memo: API Payment. depository-investment.com. Received Payment 1.5 USD from account U14732850 to account U13514943. Batch: 188003278. Memo: API Payment. depository-investment.com. Received Payment 1.5 USD from account U14732850 to account U13514943. Batch: 188113842. Memo: API Payment. depository-investment.com. Received Payment 3.00 USD from account U14732850 to account U1314****. Batch: 188153299. Memo: API Payment. depository-investment.com. Received Payment 1.5 USD from account U14732850 to account U13514943. Batch: 188217134. Memo: API Payment. depository-investment.com. Received Payment 0.75 USD from account U14732850 to account U1314****. Batch: 188253088. Memo: API Payment. depository-investment.com. Received Payment 1.5 USD from account U14732850 to account U13514943. Batch: 188321009. Memo: API Payment. depository-investment.com. Received Payment 0.75 USD from account U14732850 to account U1314****. Batch: 188352910. Memo: API Payment. depository-investment.com. Received Payment 1.5 USD from account U14732850 to account U13514943. Batch: 188414787. Memo: API Payment. depository-investment.com. Received Payment 0.75 USD from account U14732850 to account U1314****. Batch: 188466787. Memo: API Payment. depository-investment.com. Received Payment 1.5 USD from account U14732850 to account U13514943. Batch: 188481900. Memo: API Payment. depository-investment.com. Received Payment 1.5 USD from account U14732850 to account U13514943. Batch: 188588628. Memo: API Payment. depository-investment.com. Received Payment 1.5 USD from account U14732850 to account U13140691. Batch: 188628085. Memo: API Payment. depository-investment.com. Received Payment 1.5 USD from account U14732850 to account U13514943. Batch: 188673792. Memo: API Payment. depository-investment.com. Received Payment 9.00 USD from account U14732850 to account U1387****. Batch: 188721045. Memo: API Payment. depository-investment.com. Received Payment 1.5 USD from account U14732850 to account U13514943. Batch: 188790855. Memo: API Payment. depository-investment.com. Received Payment 2.25 USD from account U14732850 to account U1314****. Batch: 188918497. Memo: API Payment. depository-investment.com. Received Payment 3.00 USD from account U14732850 to account U13514943. Batch: 188976107. Memo: API Payment. depository-investment.com. Received Payment 2.25 USD from account U14732850 to account U1314****. Batch: 189133361. Memo: API Payment. depository-investment.com. Received Payment 0.75 USD from account U14732850 to account U1314****. Batch: 189269430. Memo: API Payment. depository-investment.com. Received Payment 4.5 USD from account U14732850 to account U13514943. Batch: 189286992. Memo: API Payment. depository-investment.com. 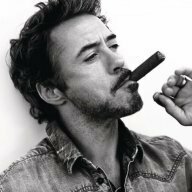 Received Payment 3.00 USD from account U14732850 to account U13514943. Batch: 189436940. Memo: API Payment. depository-investment.com. Received Payment 3.00 USD from account U14732850 to account U1314****. Batch: 189636672. Memo: API Payment. depository-investment.com. Received Payment 3.00 USD from account U14732850 to account U13514943. Batch: 189640518. Memo: API Payment. depository-investment.com. Received Payment 1.5 USD from account U14732850 to account U13514943. Batch: 190036560. Memo: API Payment. depository-investment.com. Received Payment 6.00 USD from account U14732850 to account U1387****. Batch: 186174209. Memo: API Payment. depository-investment.com. Received Payment 4.5 USD from account U14732850 to account U13514943. Batch: 190262052. Memo: API Payment. depository-investment.com. Received Payment 3.75 USD from account U14732850 to account U1314****. Batch: 190405650. Memo: API Payment. depository-investment.com. Received Payment 3.00 USD from account U14732850 to account U13514943. Batch: 190481371. Memo: API Payment. depository-investment.com. Received Payment 7.5 USD from account U14732850 to account U1387****. Batch: 186174209. Memo: API Payment. depository-investment.com. Received Payment 3.00 USD from account U14732850 to account U13514943. Batch: 190661943. Memo: API Payment. depository-investment.com. Received Payment 3.00 USD from account U14732850 to account U1314****. Batch: 190778252. Memo: API Payment. depository-investment.com. Received Payment 3.00 USD from account U14732850 to account U13514943. Batch: 190849265. Memo: API Payment. depository-investment.com. Received Payment 3.00 USD from account U14732850 to account U1314****. Batch: 191162824. Memo: API Payment. depository-investment.com. Received Payment 4.5 USD from account U14732850 to account U1387****. Batch: 186174209. Memo: API Payment. depository-investment.com. Received Payment 6.00 USD from account U14732850 to account U13514943. Batch: 191282076. Memo: API Payment. depository-investment.com. Received Payment 0.75 USD from account U14732850 to account U1314****. Batch: 191306647. Memo: API Payment. depository-investment.com. Received Payment 3.00 USD from account U14732850 to account U13514943. Batch: 191446042. Memo: API Payment. depository-investment.com. Received Payment 4.5 USD from account U14732850 to account U1387****. Batch: 186355071. Memo: API Payment. depository-investment.com. Received Payment 2.25 USD from account U14732850 to account U1314****. Batch: 191610570. Memo: API Payment. depository-investment.com. Received Payment 2.25 USD from account U14732850 to account U13140691. Batch: 191968765. Memo: API Payment. depository-investment.com. Received Payment 2.25 USD from account U14732850 to account U1314****. Batch: 191968765. Memo: API Payment. depository-investment.com. Received Payment 7.5 USD from account U14732850 to account U13514943. Batch: 191993620. Memo: API Payment. depository-investment.com. Received Payment 1.5 USD from account U14732850 to account U13514943. Batch: 192088249. Memo: API Payment. depository-investment.com. Received Payment 1.5 USD from account U14732850 to account U1314****. Batch: 192108568. Memo: API Payment. depository-investment.com. Received Payment 4.5 USD from account U14732850 to account U1387****. Batch: 186694323. Memo: API Payment. depository-investment.com. Received Payment 2.25 USD from account U14732850 to account U1314****. Batch: 192481796. Memo: API Payment. depository-investment.com. Received Payment 6.00 USD from account U14732850 to account U13514943. Batch: 192665367. Memo: API Payment. 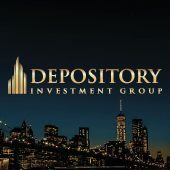 depository-investment.com. Received Payment 2.25 USD from account U14732850 to account U1314****. Batch: 192776365. Memo: API Payment. depository-investment.com. Received Payment 10.5 USD from account U14732850 to account U1387****. Batch: 192855447. Memo: API Payment. depository-investment.com. Received Payment 2.25 USD from account U14732850 to account U13140691. Batch: 193128671. Memo: API Payment. depository-investment.com. Received Payment 2.25 USD from account U14732850 to account U1314****. Batch: 193736094. Memo: API Payment. depository-investment.com. Received Payment 7.5 USD from account U14732850 to account U13514943. Batch: 193803763. Memo: API Payment. depository-investment.com. Received Payment 3.00 USD from account U14732850 to account U1314****. Batch: 194164424. Memo: API Payment. depository-investment.com. Received Payment 3.00 USD from account U14732850 to account U1314****. Batch: 194576906. Memo: API Payment. depository-investment.com. Received Payment 12.00 USD from account U14732850 to account U13514943. Batch: 194608364. Memo: API Payment. depository-investment.com. Received Payment 12.00 USD from account U14732850 to account U1314****. Batch: 194618000. Memo: API Payment. depository-investment.com. Received Payment 3.00 USD from account U14732850 to account U1314****. Batch: 194955411. Memo: API Payment. depository-investment.com. Received Payment 6.00 USD from account U14732850 to account U1387****. Batch: 194957520. Memo: API Payment. depository-investment.com. Received Payment 3.00 USD from account U14732850 to account U1387****. Batch: 195165815. Memo: API Payment. depository-investment.com. Received Payment 9.00 USD from account U14732850 to account U13514943. Batch: 195266432. Memo: API Payment. depository-investment.com. Received Payment 2.25 USD from account U14732850 to account U1314****. Batch: 195360666. Memo: API Payment. depository-investment.com. Received Payment 6.00 USD from account U14732850 to account U13876****. Batch: 195571819. Memo: API Payment. depository-investment.com. Received Payment 6.00 USD from account U14732850 to account U13514943. Batch: 195588677. Memo: API Payment. depository-investment.com. Received Payment 4.5 USD from account U14732850 to account U1387****. Batch: 195911734. Memo: API Payment. depository-investment.com. Received Payment 7.5 USD from account U14732850 to account U1387****. Batch: 196658038. Memo: API Payment. depository-investment.com. Received Payment 3.00 USD from account U14732850 to account U1387****. Batch: 197483068. Memo: API Payment. depository-investment.com. Received Payment 3.00 USD from account U14732850 to account U13514943. Batch: 198194304. Memo: API Payment. depository-investment.com. Received Payment 3.00 USD from account U14732850 to account U13514943. Batch: 202411734. Memo: API Payment. depository-investment.com. Received Payment 3.00 USD from account U14732850 to account U13514943. Batch: 204005834. Memo: API Payment. depository-investment.com. Received Payment 3.00 USD from account U14732850 to account U13514943. Batch: 207591371. Memo: API Payment. depository-investment.com. Received Payment 3.00 USD from account U14732850 to account U13514943. 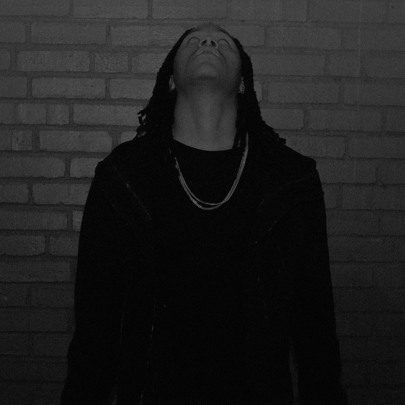 Batch: 207769357. Memo: API Payment. depository-investment.com. Проект «Depository Investment». Ваш вклад $40. Рефбек(100%). Перевели $4.0. Платежная система Payeer. Семен добрый день, начисление процентов по депозиту происходит по какому времени? 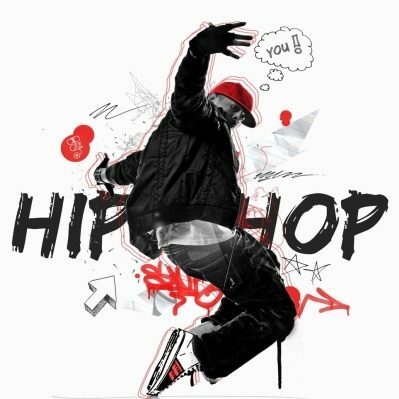 Написано время зачисления, но в это время так и ничего не пришло? Служба поддержки молчит, вы указаны как представитель проекта, может что-нибудь подскажите по этому поводу? Семен добрый день, опять обращаюсь к вам, вчерашняя выплата так и не пришла, а сегодня даже начислений не было! 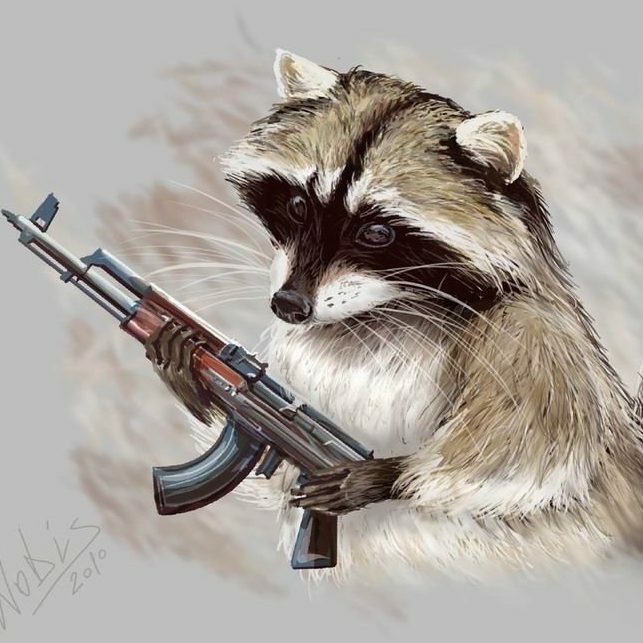 Может подскажите как связаться с админом? У меня через ВК получилось связаться с ним, говорит, планируется рестарт проекта. Проект не платит, переношу в скам. Кто соблюдал правила блога по страховке https://hyipinvest.net/straxovanie-vkladov-v-xajpax/, могут заказывать страховку. Через 2 дня заявки будут обработаны.